T.R. Vijaya Kumar, the great Indian clothes maker thinks it’s time for his country to take on Bangladesh, Vietnam, and even China for leadership in the global apparel industry. Sept 17, 2016: T.R. Vijaya Kumar, the great Indian clothes maker thinks it’s time for his country to take on Bangladesh, Vietnam, and even China for leadership in the global apparel industry. He’s a second-generation manufacturer, who transformed his small family clothing business in southern India into an apparel exporter of 1,700 employees and his goal is to double its sales by 2020. When it comes to his hometown of Tiruppur, which is mostly referred to as the knitwear capital of India, his ambitions are bigger and broader, tripling exports and adding 500,000 jobs in the process, reported Bloomberg. But the problem that is occurring is that other Asian countries are more ahead than India. India’s $17 billion exports of apparel were half as much as Bangladesh’s last year and its 3.7 percent global market share were behind Vietnam’s 5.1 percent. Apparel is a labor-intensive industry, which has helped developing economies transition out of agriculture. The Indian economy needs to generate more than eighty million new jobs by 2025 to keep up with its fast-growing population. PM Narendra Modi’s biggest failure so far has been an inability to boost employment, according to a recent poll. His new government recently announced a nearly $1 billion package for textile and garment makers, including subsidies for hiring, tax refunds and relaxation of overtime rules with a goal to create 10 million jobs and boost exports by $30 billion in the next three years. Adding to the challenge is that the textile industry suffered a reputation blow last month, August 2016, when Target Corp. terminated $90 million of business with Welspun India Ltd. for labelling cheaper bedsheets as premium Egyptian cotton. A key weakness of the sector is worker productivity, which is almost three times lower than in China. About 78 percent of Indian companies employ less than 50 workers, compared with 15 percent in China, according to Subramanium. That also means a lot of them remain below the threshold of government taxes and regulation, known by economists as the “informal” economy. A report released this year by the World Bank showed that Bangladesh had 15 times more garment workers formally employed than in the informal sector, while India has about seven times more informal garment workers than formal. There’s more holding India back. A focus on cotton garments limitThat gap could widen as foreign garment and textile producers continue to embrace automation. “India needs to start climbing the ladder fast to take advantage of its young population,” said Russell Green, an international economics fellow at Rice University’s Baker Institute for Public Policy in Texas. “Automation is making the ladder shorter and shorter over time.”s its access to the winter clothes market, while buyers perceive the country as slower and less reliable than China or Vietnam, according to the World Bank report. In neighbouring Bangladesh, where garments account for 80 percent of overseas shipments, the monthly minimum wage is about 30 percent lower than India’s $105, and exporters don’t pay duties to the European Union. Among them is Venkatachalam Babu, a small business owner who pays workers by the piece. In a workshop attached to his home, his staff of 12, including two family members, cut and stitch children’s underwear and pants from leftover fabric he buys from exporters. While foreign markets are out of reach, Babu can bank on a fast-expanding domestic market that smaller rivals don’t have. Once an employee himself, he started his company 20 years ago with four workers. He’ll register it, he said, when the headcount crosses 20 people. Tiruppur exporters have also joined forces to lower costs by educating companies on “lean” production management techniques and training factory staff to raise output. The government is partly funding the programs. Kumar said the push was inspired by Modi, who during a 2013 campaign stop told the manufacturers to make proposals to expand, rather than just list concerns. Now the group hopes to take its action plan to the capital, 1,500 miles north, and have Modi mobilize all ministers at once. Our knit wear and handicrafts have always been sought after. Indian knitwear can seriously beat other countries in uniqueness and exclusivity! Indian knitwear has always been in a great demand and with some more attention and infrastructure provided, we can surely beat other countries. 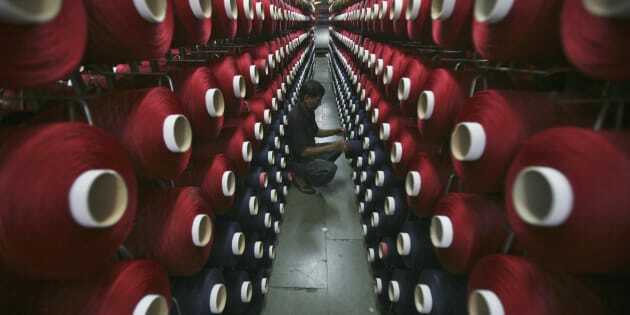 Indian knitwear can beat China, but the rate of productivity is lacking somewhere because of the employement issues! This guy has only 1700 worker and talking about taking on Bangladesh and China. I have a close friend who employed 70,000 workers in his factories in Dhaka.